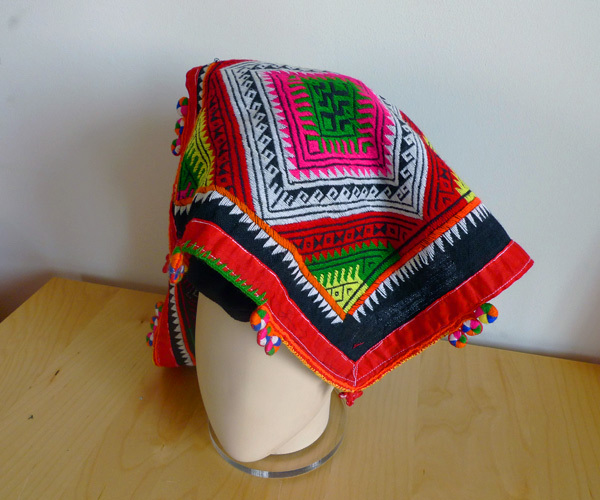 The woman's headdress of the ethnic black Tai (the Tai–Kadai language family), living in small communities in northern Vietnam, is a piece of woolen cloth with woven blue and red rectangles of the length about 120 cm. The upper part, which is attached to the head of the bride, is adorned with beads and silver pendants, and a pattern of rhombuses. This kind of wedding attire is fairly common in the mountains of northern Indochina, but each ethnic group has its own patterns and coloring of the headscarf. This is because each pattern is a symbol of which the elderly residents of mountain villages still have a lot to tell.